Editor of the 1988 Surgeon General's Report on Nutrition and Health, Nestle is uniquely qualified to lead us through the maze of food industry interests and influences. She vividly illustrates food politics in action: watered-down government dietary advice, schools pushing soft drinks, diet supplements promoted as if they were First Amendment rights. When it comes to the mass production and consumption of food, strategic decisions are driven by economics--not science, not common sense, and certainly not health. No wonder most of us are thoroughly confused about what to eat to stay healthy. Marion Nestle is Professor and Chair of the Department of Nutrition and Food Studies at New York University. Author of Nutrition in Clinical Practice (1985), she has served as a nutrition policy advisor to the Department of Health and Human Services and as a member of nutrition and science advisory committees to the U.S. Department of Agriculture and the Food and Drug Administration. She is the author of Safe Food: Bacteria, Biotechnology, and Bioterrorism (California, 2003), Pet Food Politics: The Chihuahua in the Coal Mine (California, 2010), and Why Calories Count: From Science to Politics (California, 2012), among other books. 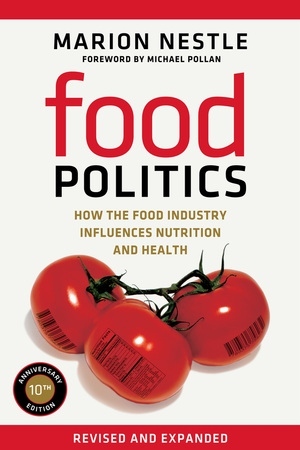 The Ancillary Materials for the 2013 Edition of Food Politics are intended to serve as a guide and a resource to graduate and undergraduate teachers. They are organized by chapter. Each chapter listing includes a quick summary, study questions, and suggested auxiliary materials, including links to articles, videos, audio interviews, and more.